"A monkey and a fish were caught in a terrible flood and were being swept downsteam amidst torrents of water and debris. The monkey spied a branch from an overhanging tree, and pulled himself to safety from the swirling water. 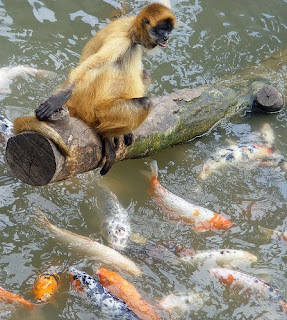 Then, wanting to help his friend the fish, he reached into the water and pulled the fish from the water onto the branch. The moral of the story is clear: Good intentions are not enough. If you want to help the fish, you must understand its nature." Many of us struggle with urges to "help" our family, friends, and others. If we work in healthcare, this is part of our everyday life. We think we're doing what's best for others. It's not that altruism is inherently wrong, but it can be confused with so many other things. Also, like the Chinese fable above, our conscious minds are clueless about the others' true natures. We interpret these according to our own skewed perceptions, rather than as they are. People are driven into healing professions by all kinds of things, any of which may conflict with the needs of the person seeking "help". If this is so, we're at risk of yanking perfectly good fish out of the water that gives them life. We mistakenly think we're rescuing them. Heroics are needed at times (massive trauma, strokes, heart attacks, etc), but most of the time they're not. Most situations call for allowing the person's own healing resources to materialize and consolidate. They usually have more than we realize. We're more likely to be in such a place with others when we're listening and cleaning, than when we're rushing around trying to decide what they need. Doctors can help support whatever in the patient temporarily seems to need this. But healing itself is God's work. Dr. Hew Len has told me that there are really no illnesses, only memories showing up for release. Patients bring endless opportunities to clean, that's all. This could certainly be so, yet I'm unevolved enough that seemingly ill people show up around me. So, I have cleaning to do as I work with whatever in me attracts them. Hopefully I can be calm enough to clean as they share their suffering, rather than get swept up or lost in drama. Hopefully in this peaceful space, Inspiration can come. "People aren't there because they need you," says Dr. Hew Len. "What they need is God. Are you going to stand in the way?" For me, that puts it in a nutshell -- just like the Chinese fable above. To recognize I am clueless, yet to also be unafraid to act when it seems through cleaning to be correct, is hard for me. I do the best I can, and take another step along the path. Do you remember Pigpen, from the comic strip Peanuts? He was the kid who always had dirty stuff flying around him, like a constant dusty haze. Although he never seemed bothered by it, the other kids (and even Snoopy!) were clean and shiny by comparison. Perhaps many adults live by this too -- it's a slick way of deflecting the blame for anything that happens onto others, so that we don't look like "Pigpen". Instead we're more like Teflon that way. So once we know we've "got it" (by virtue of having noticed it), then we can set about our cleaning. We can say "Wow, Divine Creator! I didn't know I had that! Thank you, I love you" even when life feels like it's slapping us upside the head. My family has been dealing with an alcoholic member for years, and more intensely in the last several months. We're seeing how we're all a part of what goes on -- except, that is, for the person doing the overt drinking and raising other kinds of ruckus. For me, this has been an amazing opportunity to walk the path of 100% responsibility, even when it "looks" like someone else has the disease, not me. This is a little challenging, in that people with alcoholic families often have built-in trouble with our boundaries. We tend to take care of other people's business rather than our own. We can get so wound up about other people's seeming "problems", we forget to inhabit our own lives. This is, of course, textbook co-dependency. And it can be mighty draining. Now, if Ho'oponopono says "the problem" is all in us and our memory-skewed perceptions, how do we differentiate whose business is whose? How do we let go of "the alcoholic's" problem and tend to our own stuff? Do we tell the alcoholic s/he "should" go to AA, or "should" clean with Ho'oponopono? Do we lecture, cajole, beg? No. None of that. Moment by moment we clean with our own responses, whatever they are -- recognizing that "Pigpen" is in all of us, not only some of us. Telling others what they "should" do is the opposite of Ho'oponopono, which encourages us to sweep our own front porch rather than running over to someone else's. I'm finding that my own messes keep me plenty busy, believe me. Lately there are some birds who like to perch above my entryway, leaving daily evidence of their presence. I've been sweeping, but couldn't figure out why all the bird poop was collecting at my place. At the same time, I had been in a kind of verbal struggle with these family members, feeling frustrated and upset. After all, I wanted them to want to heal -- as if I can personally push the tide. Yeah, right. One had sent what appeared to be a written "mea culpa" statement, but it was potentized with crazy-making meta-messages. In other words: "I'm rubber, you're glue -- everything bounces off me and sticks to you". With this, I was feeling pretty "bent". But this was not to continue, thank heavens. In the wee hours this morning I "got" the message. 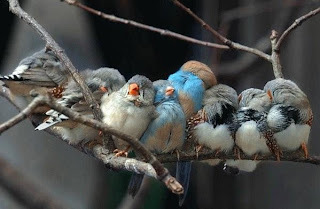 Those birds are showing me my own personal "Pigpen" layer of stuff to clean, and where I need to direct my efforts. My very own front porch, not anyone else's. Perfect. So I wrote back, saying I would be tending my own business from now on. It felt like a ton of bricks fell off my shoulders. Wow, Divinity. I didn't realize I even had that. Thank you, thank you -- including for sending that bird poop. A roadrunner similar to the one above visits my backyard regularly. He's persistent and hilarious, knocking on my sliding glass door with his beak! Within days of my moving into this house, he was my first official greeter. Strutting back and forth on the patio, he catches my eye and seems to be asking me to come outside. So I do, and then he leaps up to the fence between my yard and the desert. He perches there, fluffing up his chest feathers and making gutteral noises before fluttering on his way. Roadrunners are in the "cuckoo" family, and their gait can be somewhat clown-like. My friend reminds me to laugh, and not take myself so seriously! Yet they're also so agile and quick that they can prey upon rattlesnakes. I've not seen him eating any in my yard, but maybe he has and I've missed it. It's a wonder to have a being like this in my life; why should he be coming to me? I looked for possibilities in my animal totem books. Several sources say that Roadrunner teaches the qualities of mental sharpness, quick thinking, and fast responses -- knowing when to strike efficiently with timing and precision. Those with this medicine are highly intelligent (! ), thinking quickly on their feet. My little guy has the most expressive crest and tail, along with shiny dark eyes. I often wonder what's going through his bird-brain? With this, one could get suspicious of one's ability to think at all . . . except when Love is in charge. My agile-minded roadrunner friend reminds me not only to laugh, but also to value moving quickly with Inspiration. Modeling him, I can let Divinity direct me rather than obstipate endlessly over possible outcomes. Cleaning is the key -- and is preparation for all activity. Thinking too much can make you trip over your own feet! 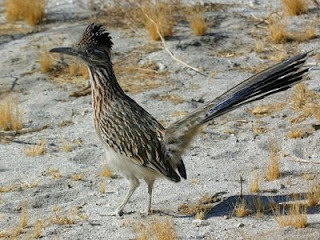 Compared to those of humans, the roadrunner's feet are relatively big -- yet they work perfectly for him. Cleaning allows the situation to unfold naturally, without effort or suffering. As the errors are moved to love through cleaning, the situation is allowed to unfold divinely, perfectly. And this is so with any relationship or situation in our lives, no matter what it might be. Handling the situation by thinking causes chaos and confusion. First of all thinking deals only with effects, what is perceived, not causes as cleaning does. Thinking comes from "I know" yet only love knows, really. Cleaning works inside self where the memories are that cause our problems, disease, death. Cleaning is about creating a peaceful and wonderful relationship wiht love and everyone and everything. Thinking pits the individual against others. Cleaning is about peace beyond all understanding. Thinking is about trying to understand the nature of things, which is beyond the intellect's ability to do so. I love my feathered pal, and know he's part of this beautiful desert that's so much larger than me. He's part of the rhythm of life here, and helps me both appreciate and yet let go of my intellect. My mind works quickly, and sees apparent connections . . . yet its interpretations can be wrong. Just when my intellect is bemoaning this or that, my neighborly cuckoo-bird comes knocking on my door! Is he making fun of me? Or is he simply reminding me to clean? Maybe both -- exactly when I need them. Through his chortling ministrations I can let go of my mental obstipation. Better to be a little "cuckoo" than "kukai pa'a" [mentally 'stuck'], after all! Ho'oponopono Cleaning: How Does Your Garden Grow? "Flowers are sunshine, food, and medicine to the soul." Although many places still have snow, it's spring here in the Sonoran Desert of Arizona. Our currently blooming wildflowers -- such as penstemon, chuparosa, fairy duster, lupine, and creosote -- are delighting all the hummingbirds, insects, and humans who live here. The double yellow hibiscus above is not a native Arizona wildflower, but happens to be a Ho'oponopono cleaning tool. Growing this plant, looking at its photo, or simply thinking of it invokes the Ho'oponopono cleaning process in a simple and lovely way. Seeing it makes me smile. 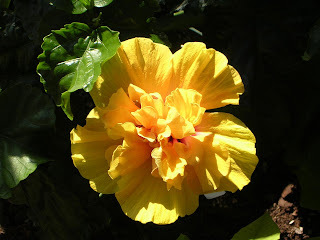 The double yellow hibiscus is said to represent God consciousness, and the spiritual essence of gold. What a perfect tool when people are fearful about their wealth, and ability to support themselves and their families! As the plant blooms, its flowers are to be allowed to fall to the ground where they can sustain and enliven Mother Earth. How many of us think that way, these days? Do we hoard what we have, or circulate it freely? Do we even think of nourishing the earth on which we all depend? If you're a gardener, you might. Nature teaches many things through such partnerships. Today I took lessons in my yard -- hoeing, weeding, and conversing with the hummingbirds who darted all around me. I was gently trimming the red pineapple sage they love so much; the birds seemed to approve. The trimming makes for more flowers, sweet and succulent for their enjoyment. While working, I blessed the plants with "ice blue" (a good tool for soothing. It helps for humans too.) Then I worked in a combination of fresh soil and compost, all the better to grow with. Also it was time to plant tomatoes, peppers, dill, and more lettuce. But first, surprises greeted me: new volunteers of basil and lemon balm peeped up from the soil! Nature has been busy; the spirit of Life springs forth when we're not even looking -- or trying to control things. This is a timely lesson for me. Perhaps the act of planting is truly an act of faith. Do we really trust that our tomatoes will know what to do when we put them in the ground? Or, do we need to keep pulling them up to see if they're growing roots yet? Do we need to keep our gardens spotless, or can the compost of life really nourish more growth? Can we simply accept what is, and make use of it? Can we be grateful for what shows up, even if it seems in the "wrong" place? So many possibilities, in a little planting bed . . . it's like Ho'oponopono in action for me. My hands love working the soil, and I love feeling and smelling the plants. My heart needs to feel God's presence; thank heavens this comes in so many ways.